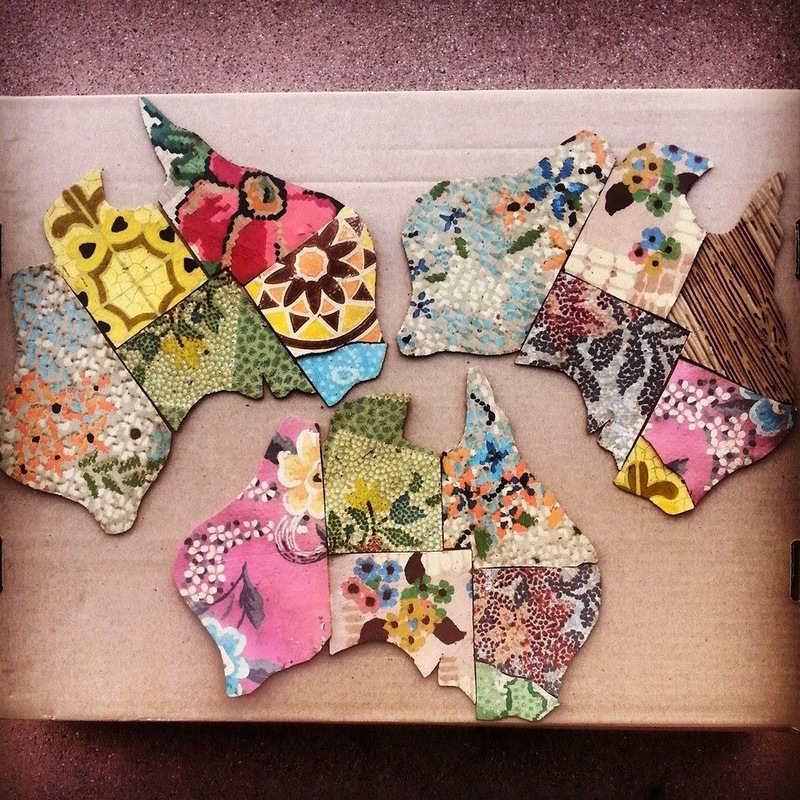 All Large Maps of Australia are on sale in my Etsy shop! And the square bunting is now available too! It's been a while between posts I know! 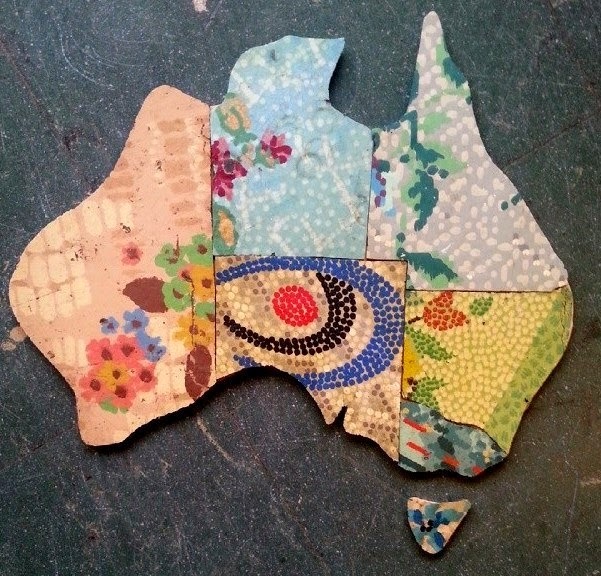 I have still been cutting and gluing lino non stop...especially the seven states of Australia. Right now all Maps are on SALE in my Etsy Shop. But it's just for the month of March and hello!!!! it's almost over already. Hello. I'm back for a long overdue visit. Things have changed a lot in my world since I last posted 2 months ago. 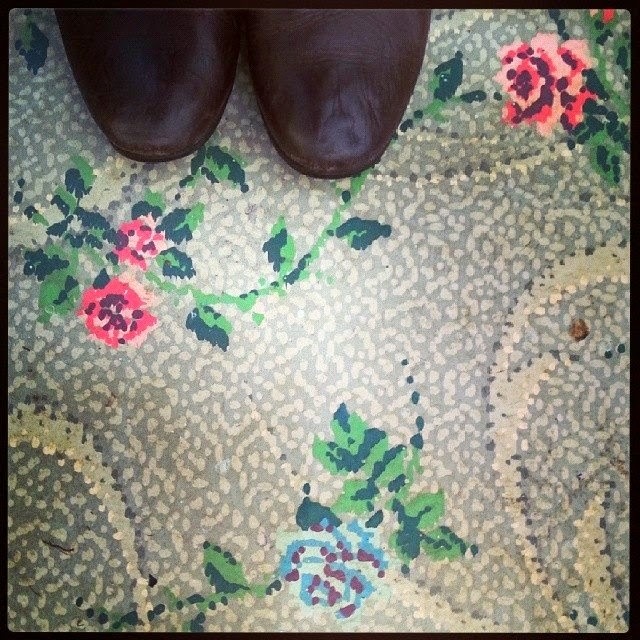 I have moved out of my lovely Brunswick shop Gleaners Inc. and am having a wee spell before I embark on new endeavors. Gleaners Inc. has not gone away for good though, there are plans on the horizon....we are just waiting on the right alignment of the stars and moon! 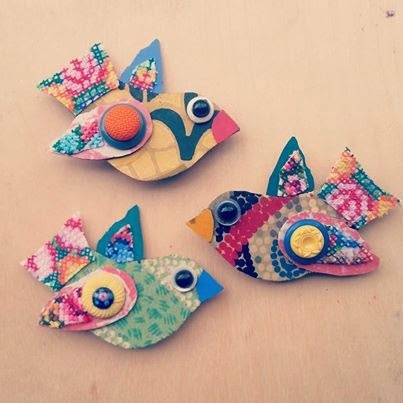 I have moved into a fantastic light filled studio in Nth Fitzroy and have been busy making new things! Right now every reader can use this $5 gift voucher to spend at Betty Jo's Etsy store. Just enter code HelloBettyJo at the checkout. 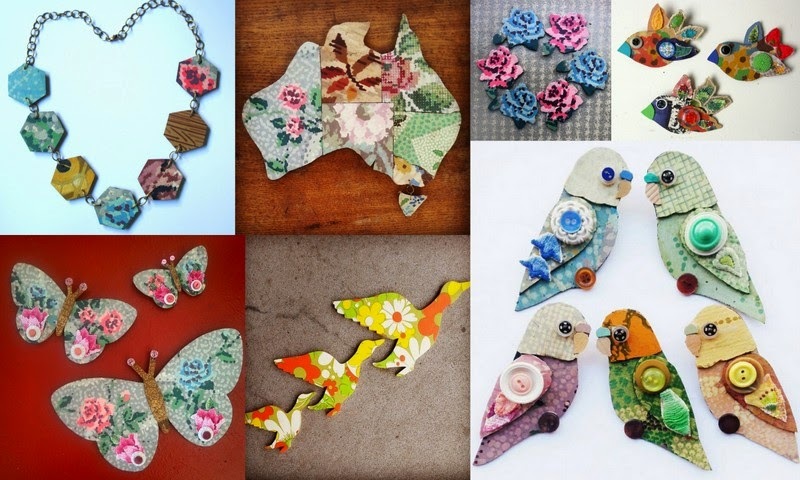 There are maps and budgies and roses and butterflies and ducks and more available right now! "Hi there! 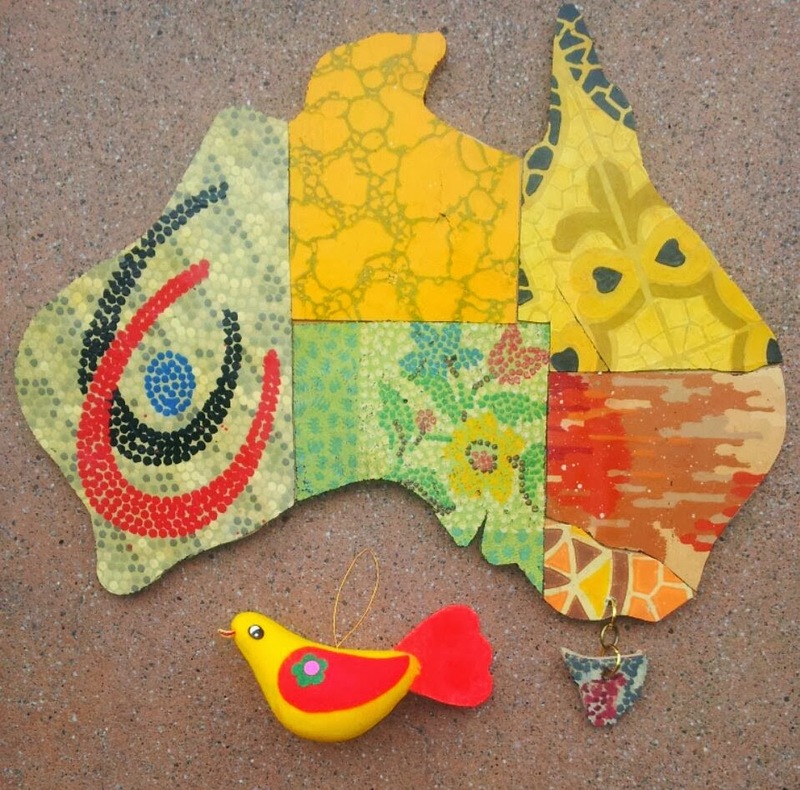 I ordered the fabulous "Australia" wall hanging you sent to Southport, QLD this week. It is just so so SO gorgeous ... even better than I'd hoped! I will be gifting it to a friend for her 50th birthday In August. 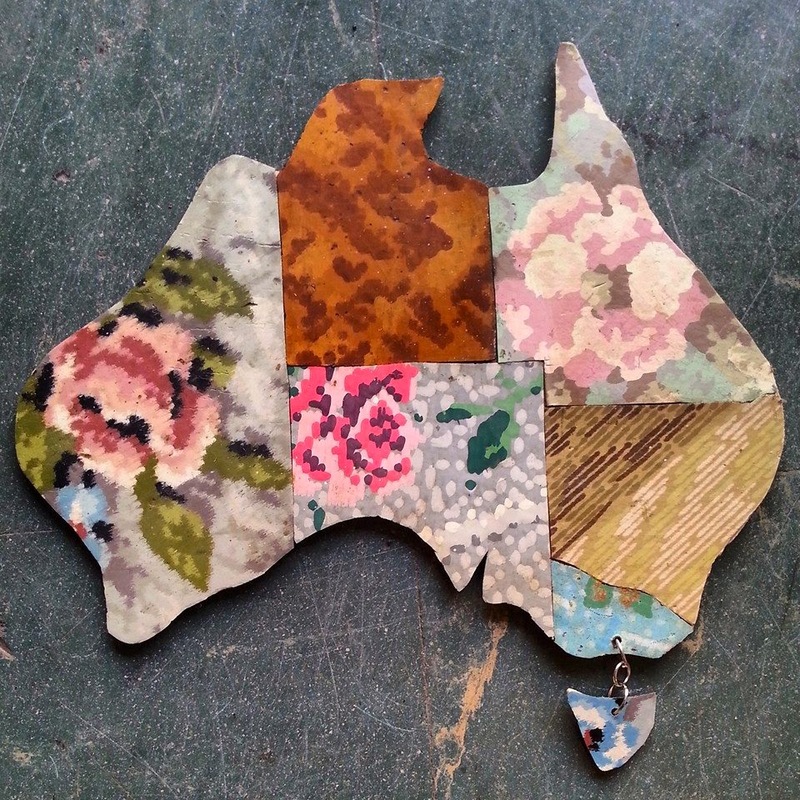 She lives in a cute, old fibro cottage on a lake on the NSW South Coast and has travelled right around Australia so I think this could not be more appropriate"
If you would like to have your own special Map of Australia they are available from my Etsy shop.or pop into Gleaners Inc. to choose one in person. 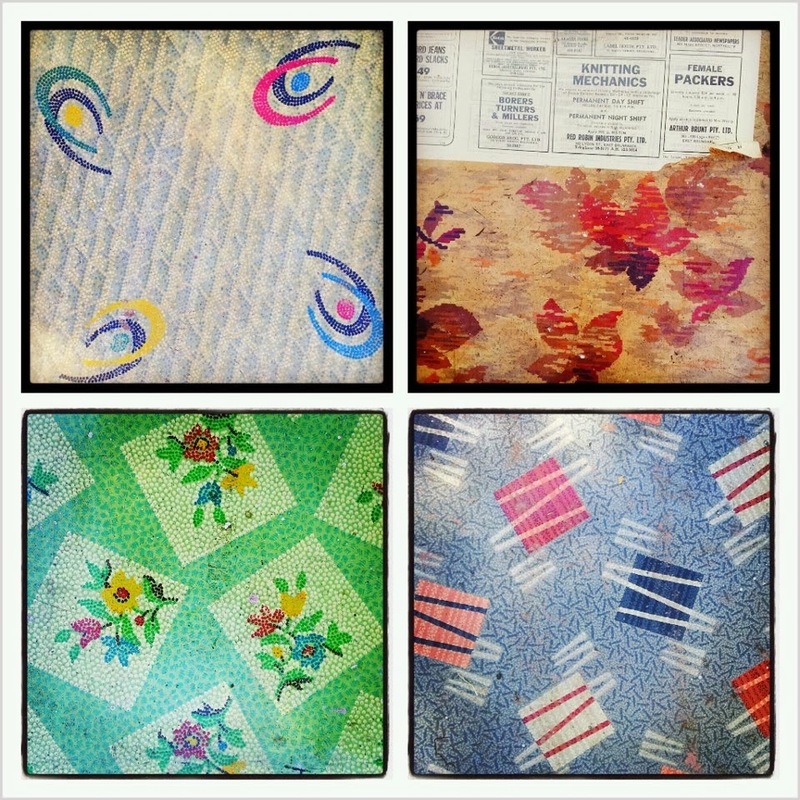 They are all made from pre-loved linoleum from the 40's and earlier. This Map has some pretty rosy Lino I rescued from a house reno in Brunswick. Breaks my heart to think it was on it's way to the tip! Sometimes when you are looking for a new twist on one of your popular products, the idea is right under your nose. 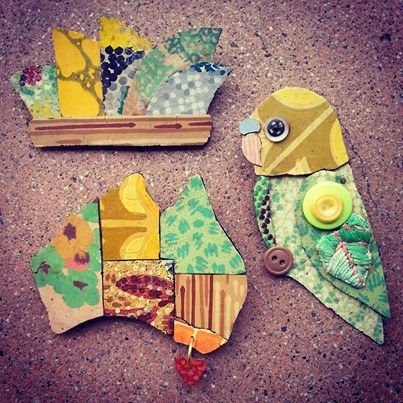 Over the last few weeks it was one of my favorite times of the year in my neighborhood- The HARD RUBBISH COLLECTION. I found a funky 70's vinyl blind on someone's nature strip and took it to my studio thinking I'll use it for something one day. Then I thought a set of ducks would look cool covered in the retro pattern. Then in further fossiking expeditions I found four more discarded blinds and covered more ducks. Miss Lily was catching the bus home from Brunswick and spotted some guys dumping a pile of this pretty vintage lino in a rubbish pile. Not wasting any time, I zipped over with the car and asked nicely if I could have it. "Yep, sure. It's just going to the tip" was the reply. 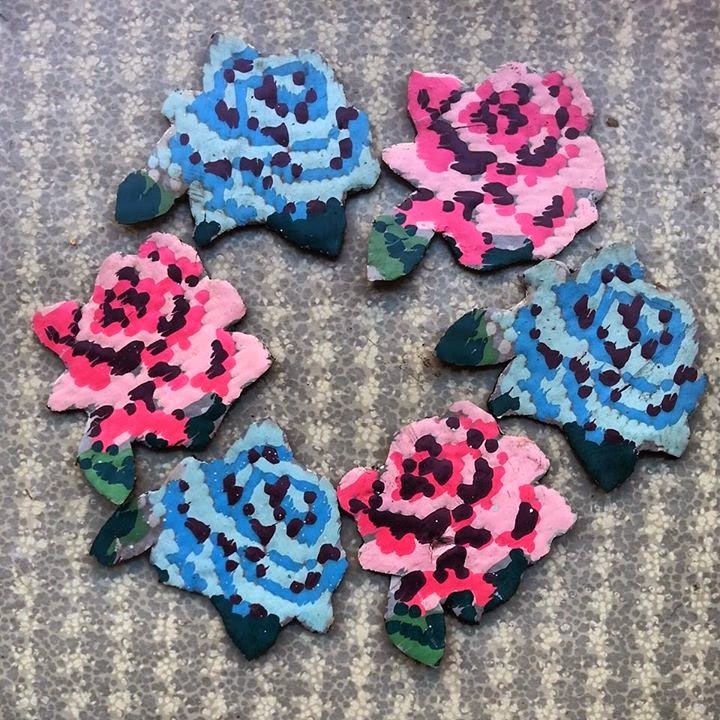 I have made a limited number of rose brooches from the lino and right now they are available for a Special Mother's Day price of $10 each plus postage. They are for sale in my Etsy store here. 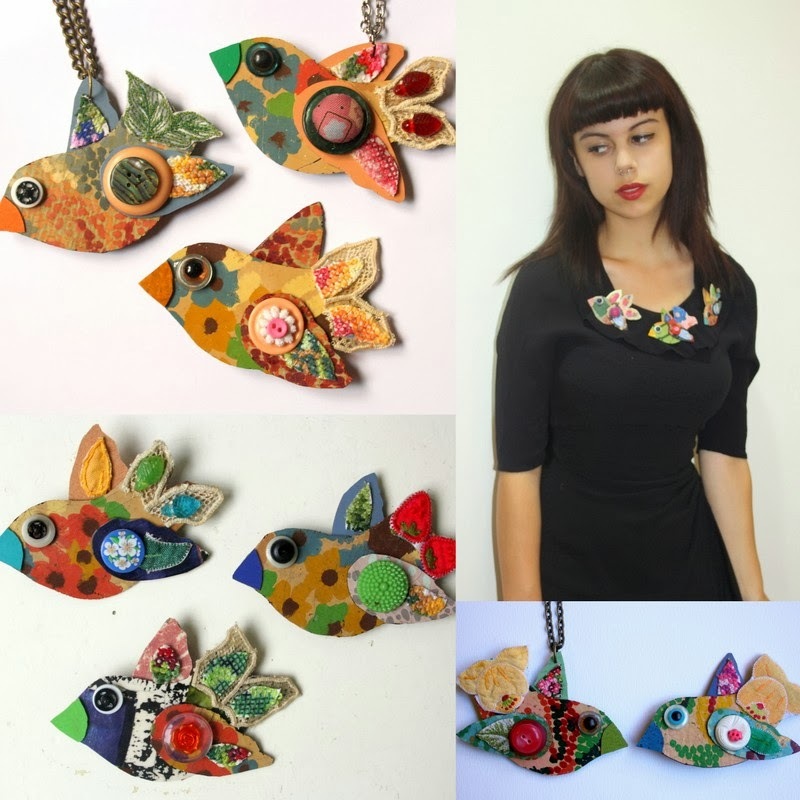 But be quick as there are only two of each colour left! 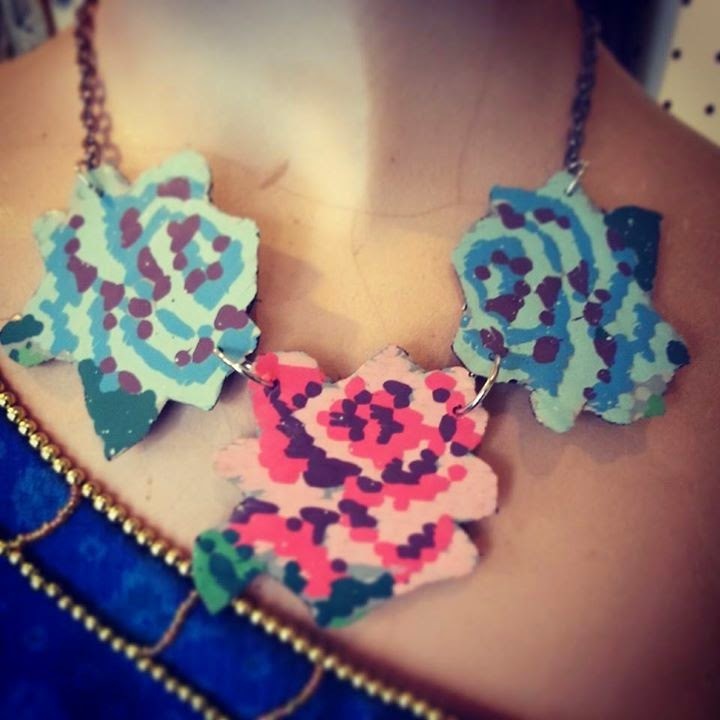 There is also a very limited number of Rose necklaces. These are available at my shop Gleaners Inc.
............or leave me a message if you are interested. Kitties aren't forgotten either. 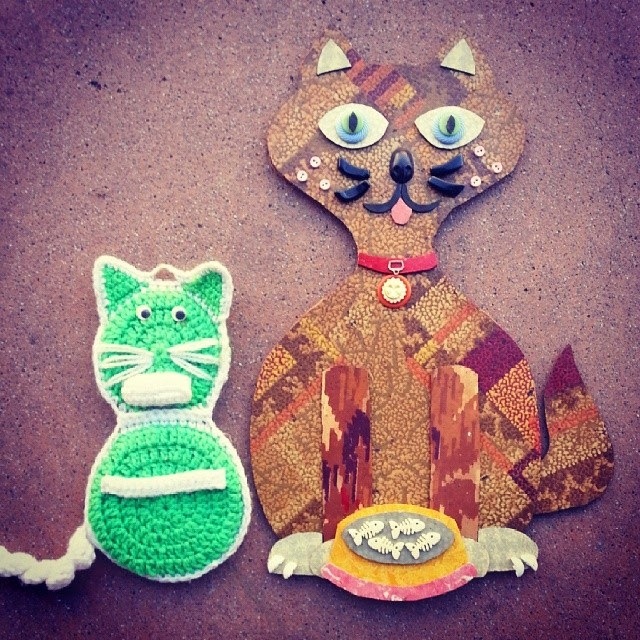 This cheeky guy is a wall hanging. The Noah's Ark of Craft! I just read somewhere that foxes are the new birds. I thought budgies were the new flamingo's, that were the new llamas, that were the new sloths, that were the new bunnies, that were the new horses, that were the new donkeys, that were the new owls. 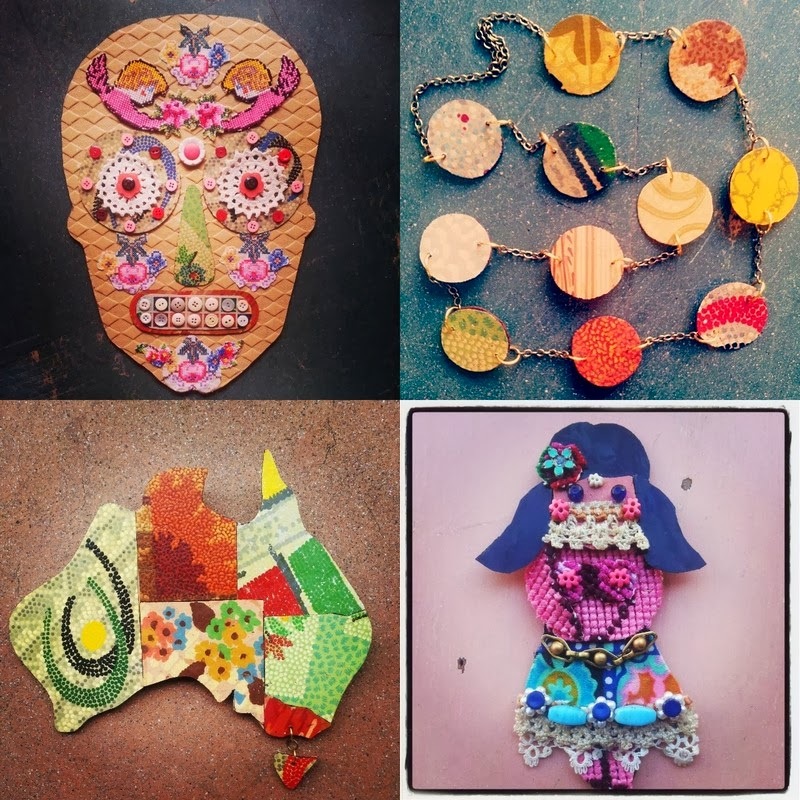 Craft is a Noah's ark of animal motifs and what begins as a cute new image on indie designer goods often ends up done to death on everything from school stationary at Officeworks, to kids undies from Target. Today on Facebook I asked "What animal is on trend in your world?" One of my friends answered "Please let's have something native to Australia, not another bleeding' woodland creature"
I tend to agree. As much as I love the cute European critters, I'm tiring slightly of deers, foxes and their furry friends. This is my effort to fly the flag for Aussie Fauna! Still plenty of cute critters to choose from too. Maybe a ring tailed possum will be next. 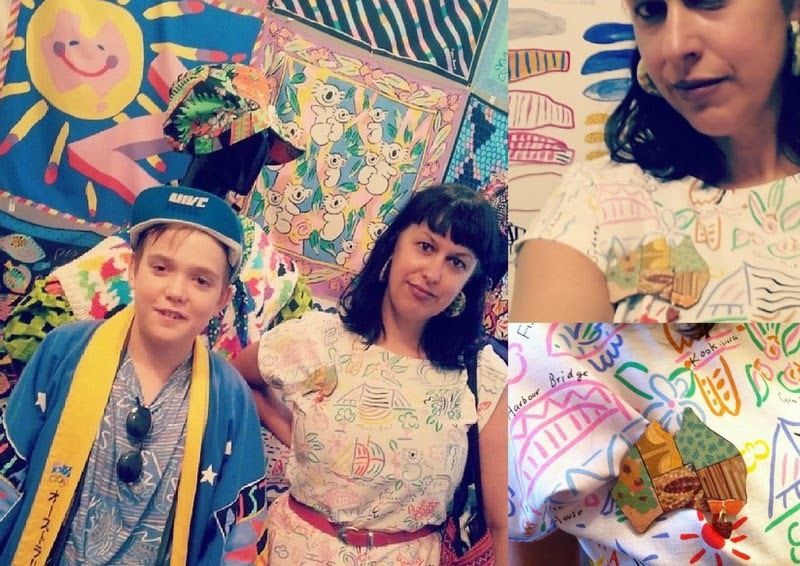 Last night I went to the launch of Patternation, a thoroughly mind blowing collection of Oz fashion from iconic 80's designers and contemporary practitioners. Jewellery by Kate Durham (who was my idol at art school) and fashion by Jenny Kee, Kara Baker, Ken Done ( who was kinda daggy in the 80's but ironically cool right now) and Linda Jackson to name a few. 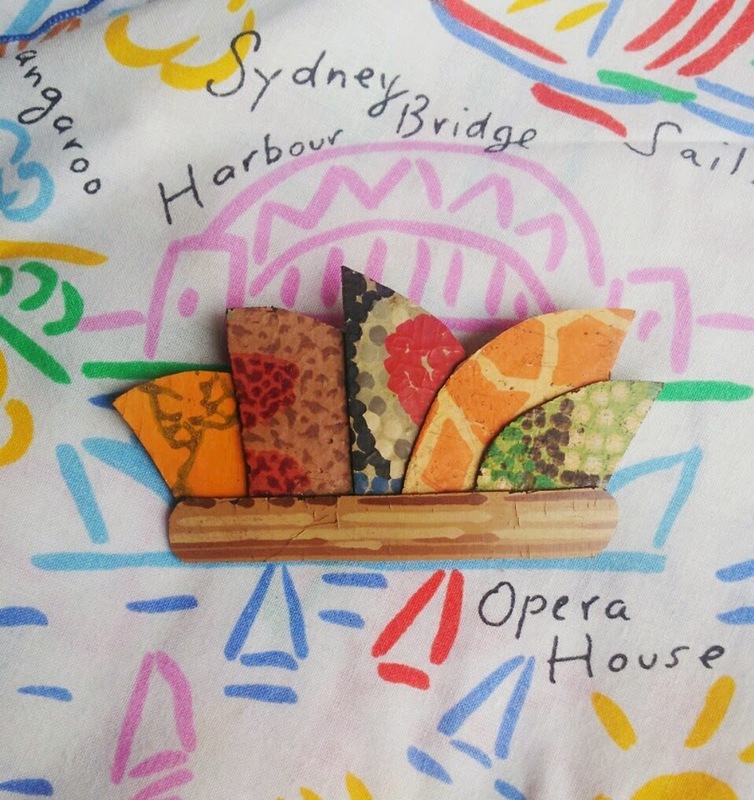 I wanted help deciding which brooch to wear on my Ken Done dress ( made by Lily from a tablecloth from Savers) so I asked on Facebook.....the Opera House, the Map of Oz or the Budgie? So here I am Rockin' the Done with the very cool Devlin who has a mighty collection of 80's street wear and Ken Done vintage! 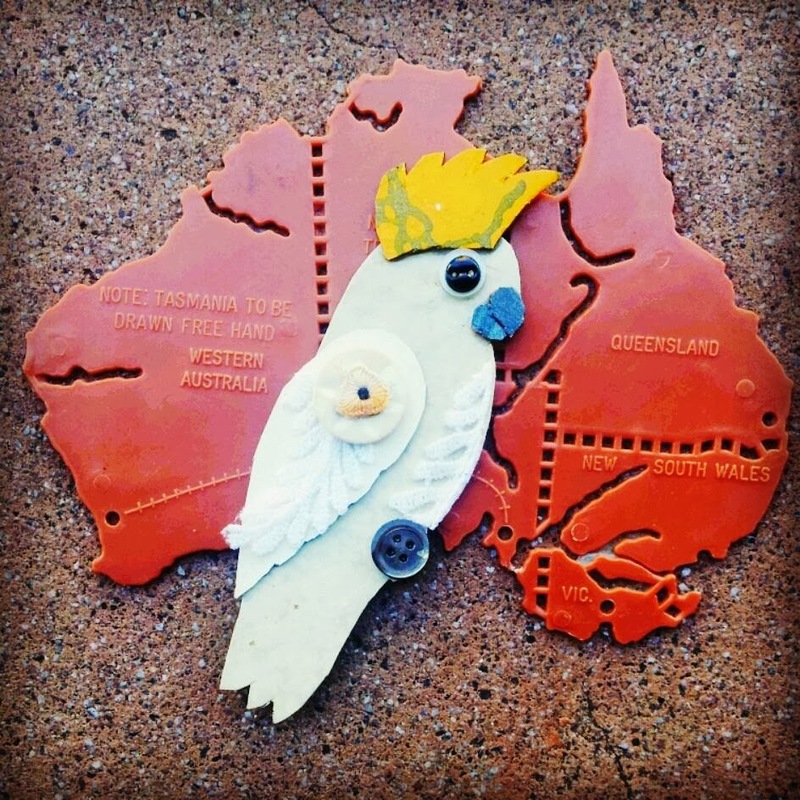 Once again it's been all about the Maps of Australia. 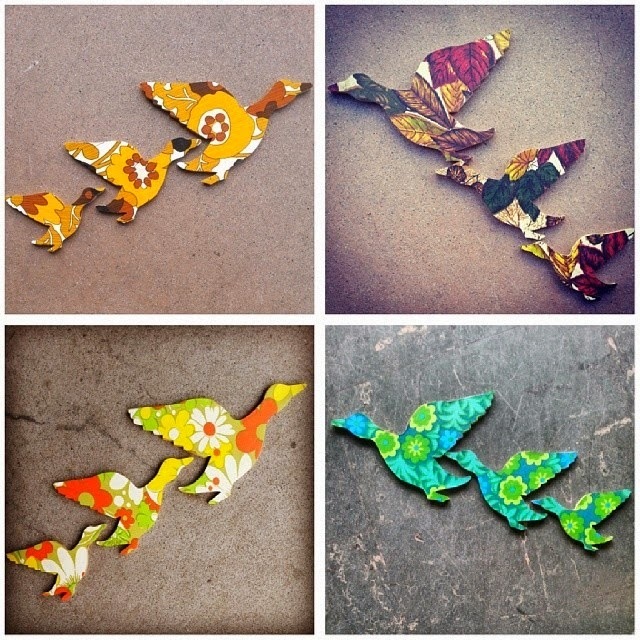 Several orders are heading out soon, so lots of cutting and assembling is going on in the studio. 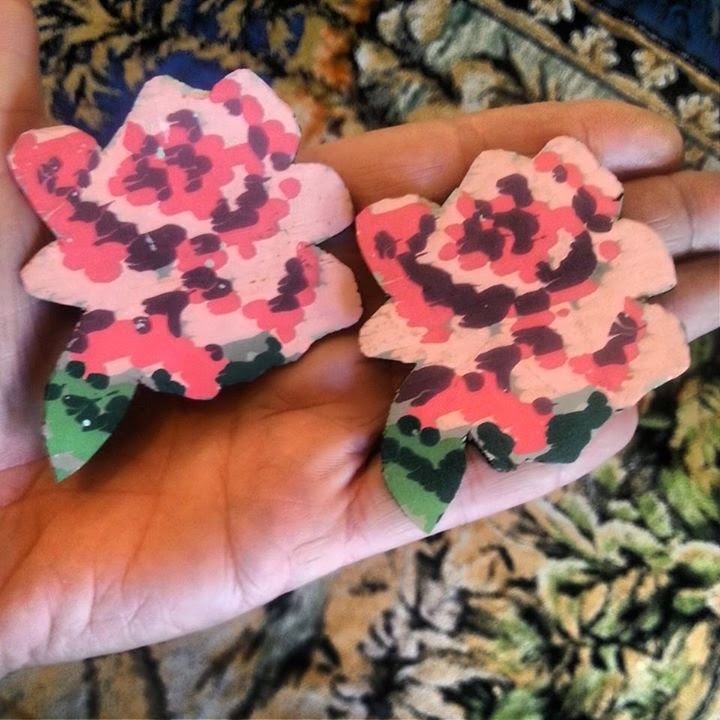 I dug out all my pretty floral lino for some of these. Kinda looks like our wide brown land has turned into a bunch of flowers. 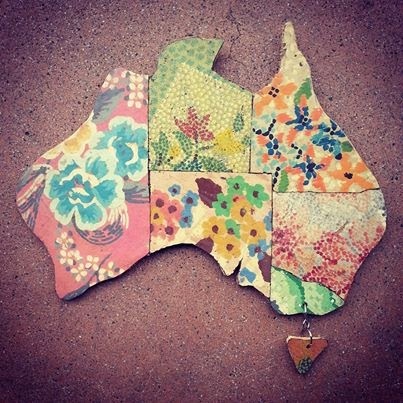 The iconic shape of Australia has got me thinking about the theme for the next exhibition at Gleaners Inc........stay tuned!!!! A Penny for a Picture! I received my first Royalty payment from Getty Images last week! It wasn't a massive amount by any means, but it's certainly nice to get some credit for your creative endeavors once in a while. And I'm happy to see my obsessive button collections have made a small impression on the folks at Getty!. 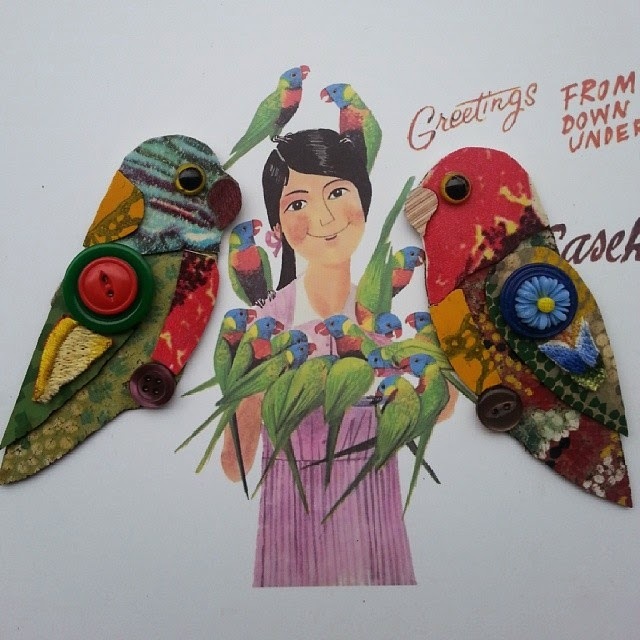 A few of these swallows and some other feathery friends have fluttered off to roost at Jay from Finki and Anna from Polly Pratt's new retail venture Ruby's Nest. 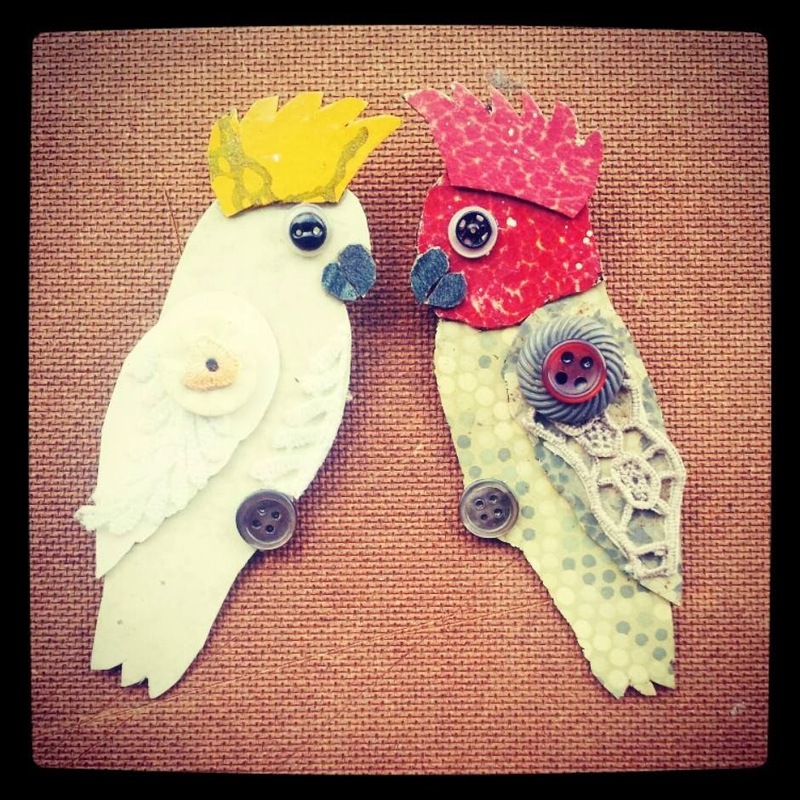 It's a gorgeous shop full of pretty, colourful dresses and accessories so I'm sure my birdies will fit right in! 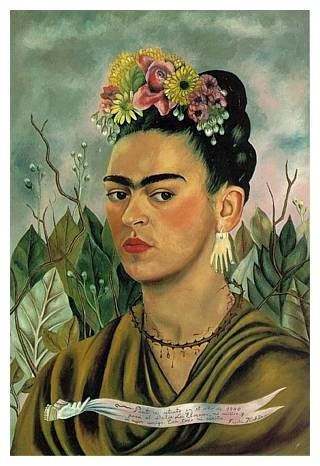 I am one of millions of people who are inspired by Frida Kahlo. Her work, her beliefs, her style and strength. An amazing woman who channeled her pain and tumultuous life into intricate and colourful paintings. Her explicit, intensely autobiographical work has received world wide critical acclaim and her image is recognized globally as a symbol of beauty, creativity and feminism! I thought it was about time I branched out and gave the baby budgies some friends. So hello Sulpher Crested Cockatoo, Gang Gang Cockatoo, and Galah! I love these cheeky fellows in the wild. Their beautiful flashes of colour and raucous squawking remind me how awesome Australia's native fauna is. So cool and unique. 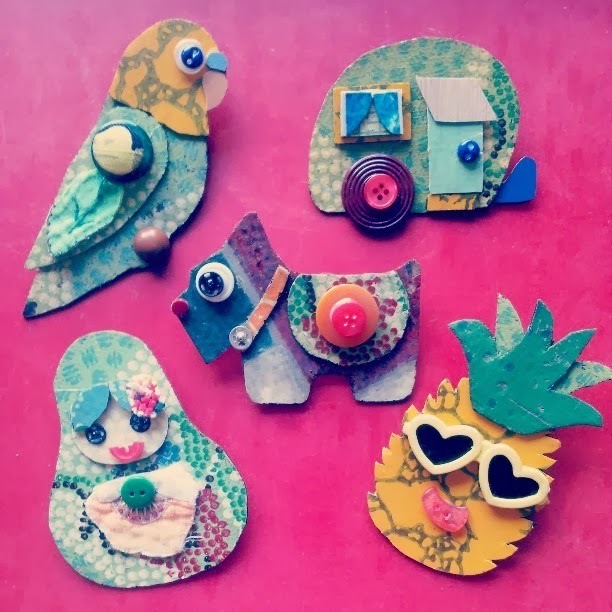 The Cockatoo and Budgies brooches are available now at Gleaners Inc. 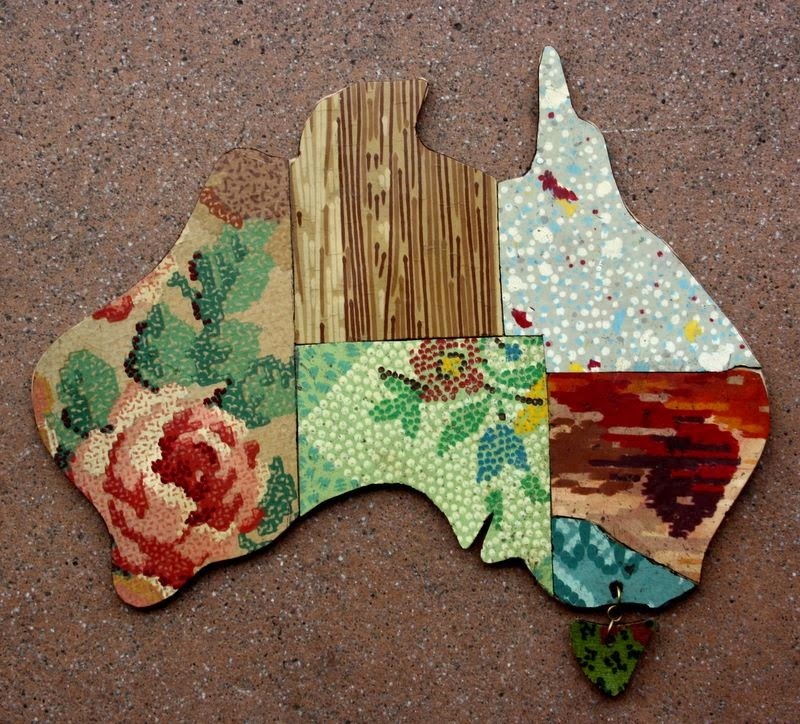 Custom made Map of Australia. Belly dancer for the "Materialized" Exhibition at Gleaners Inc. opening on the 1st of March. 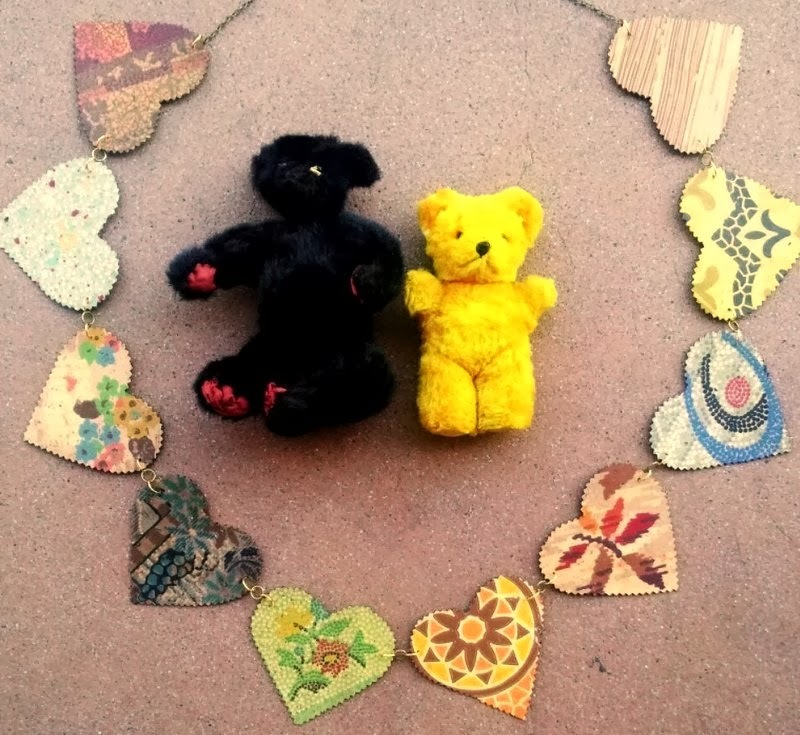 I have continued the Heart theme at Betty Jo headquarters and designed a Lino Heart Strings Bunting. Perfect for adding some romance to your abode! 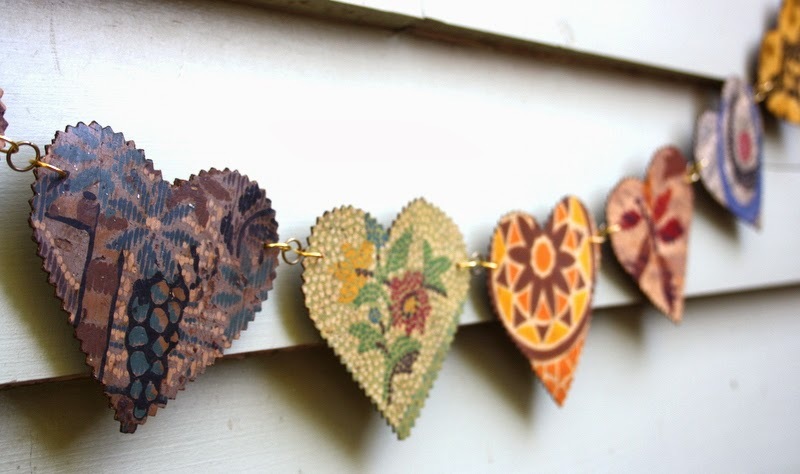 I have linked 10 vintage lino hearts together to form a 160cm long bunting that would look ace in a retro themed house. The Heart Strings Bunting is available in my Etsy shop now! 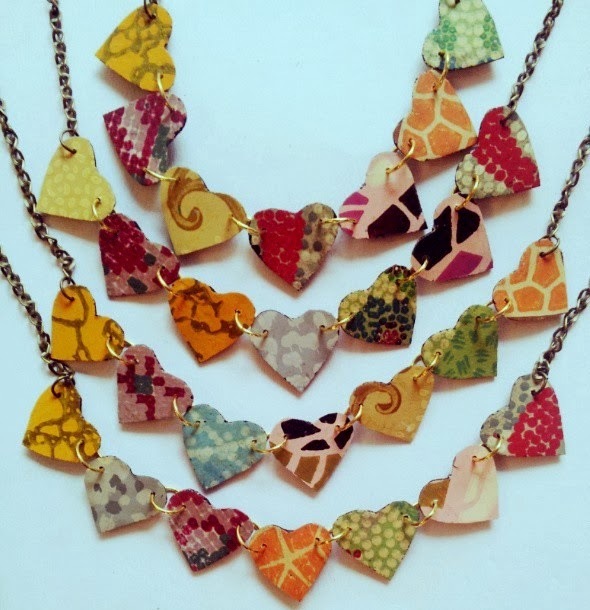 If you like Hearts and a BARGAIN, I am offering a $10 dollar discount on all Heart Strings necklaces in my etsy shop right through February. Just add the code HEARTSTRINGS at checkout! As you can see, I'm a bit in LOVE with hearts at the moment. Once again Gleaners Inc. is participating in the Virgin Australia Melbourne Fashion Festival's Cultural Program. 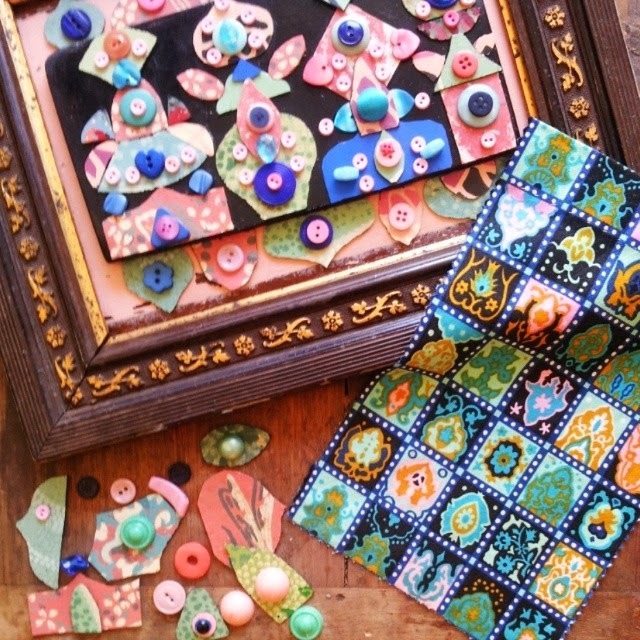 A month long exhibition titled "Materialized" will run throughout March at Gleaners Inc.
Gleaners Inc. has invited designers, artists and craftspeople to take a swatch of vintage material and use it as inspiration for a creative project. 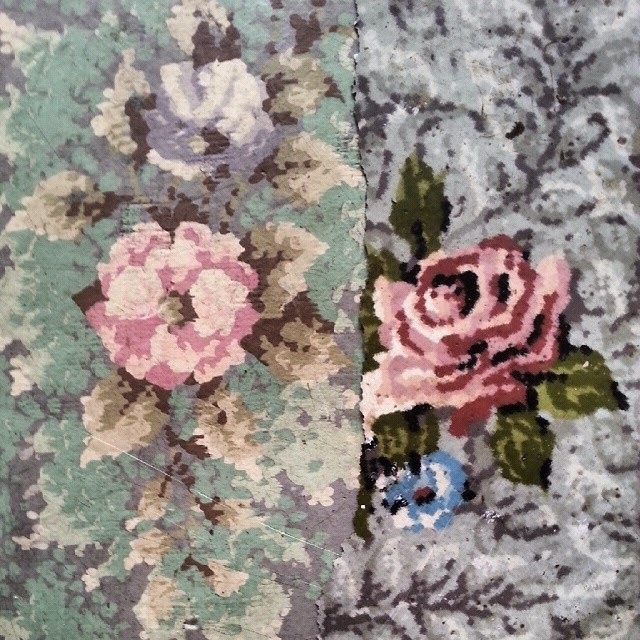 All participants must respond to the fabric, ie; the pattern, the texture or the colour palette, by creating a finished piece incorporating or referencing their swatch. The material will plant the seed of a creative idea and the final designs will “materialize” as the ideas germinate and grow into the finished piece. 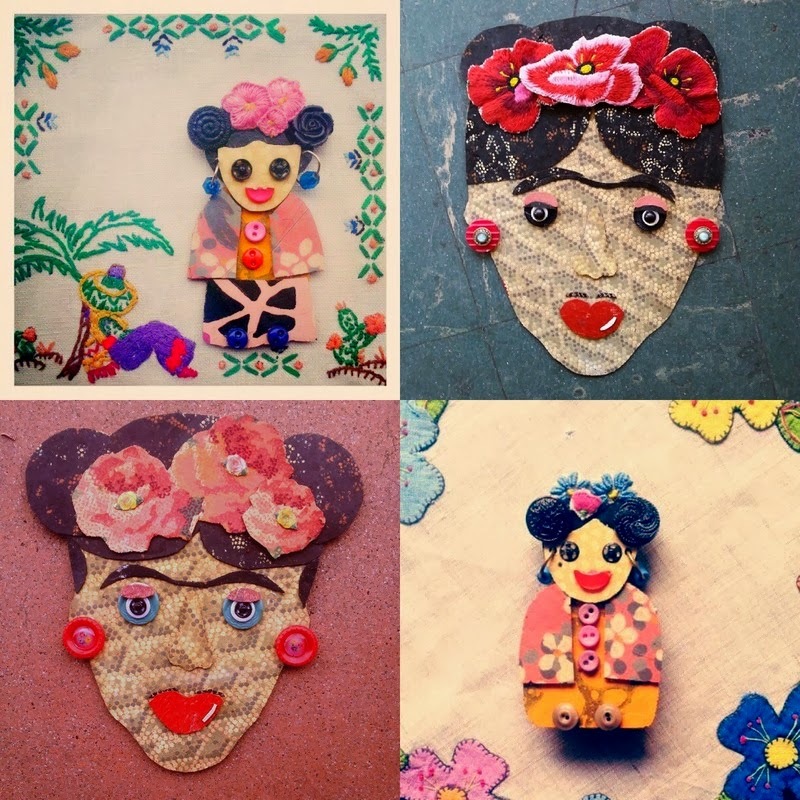 The result will be a diverse collection of work that incorporates fashion and clothing, textiles, jewellery, accessories, works on canvas and paper and sculptural pieces. 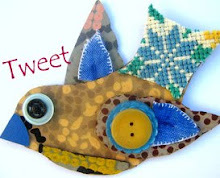 Here is a sneak peek at the one of the pieces I have been making. 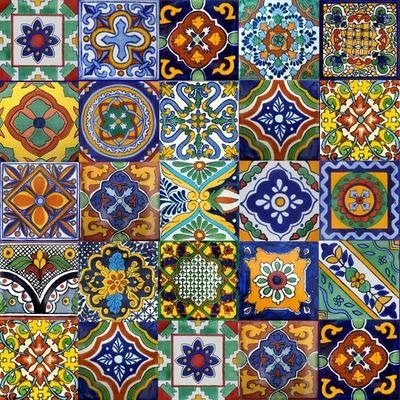 The fabric has a Moroccan feel to it, referencing these ornately glazed tiles.
. I am looking forward to seeing all the wonderful work that is being created for the show! Well it is coming up to that Day in February! 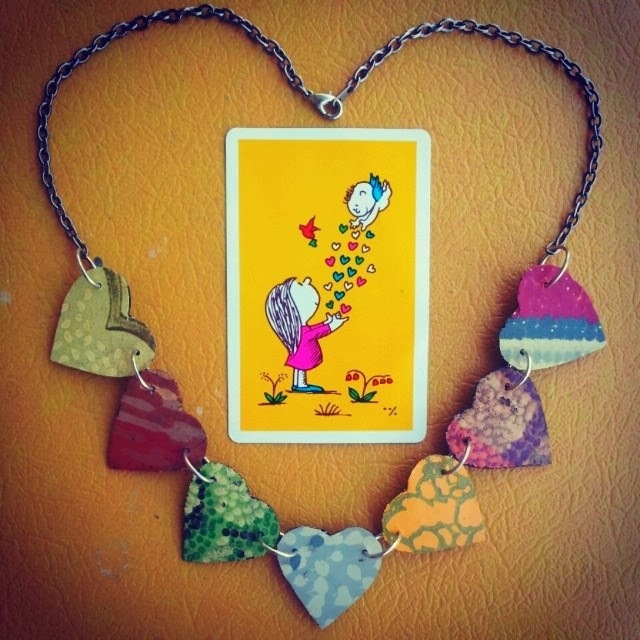 You can purchase my Heart Strings Lino Necklaces from my Etsy store. 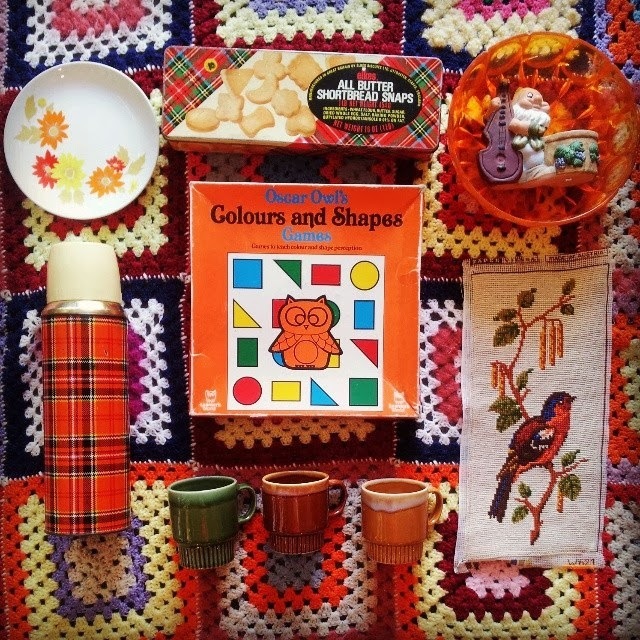 As you may well be aware, my greatest love in life is partaking in a good opshop. On a day trip to Bendigo last week it seems I had an unintentional opshopping colour scheme going ! 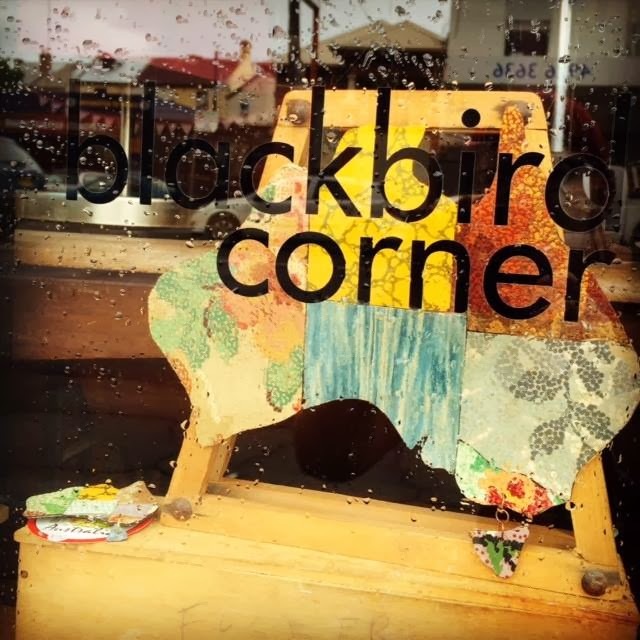 And because it's Australia Day, and all that it represents in our contemporary society, here is one of my Maps of Australia sitting in the window of the excellent Blackbird Corner in Newcastle! The year started pretty slowly at Betty Jo Headquarters. Studio pottering, not really focused on any one thing......until yesterday. 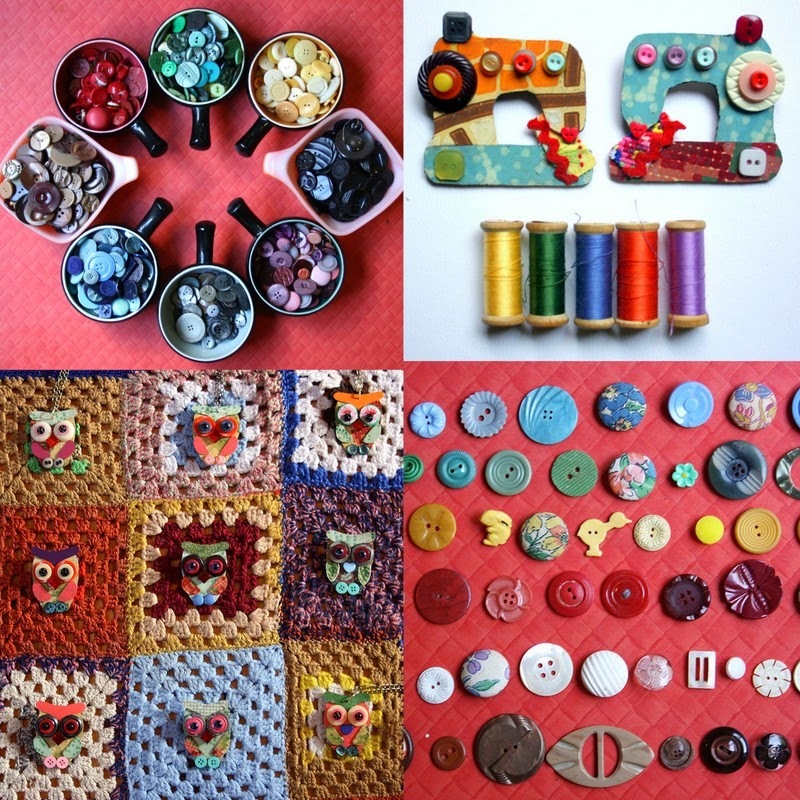 I was scrolling through instagram and happened to notice several crafty friends vintage fabric stashes all neatly sorted and colour coded. Wouldn't some of these fabricy bits make pretty bunting I thought ( it's hard not to think of bunting when you are sitting in a shop FULL of it!). Then I glanced over to my higgledy-piggledy pile of lino and *Bing* (that's the light globe switching on) I set to and made the Betty Jo version of pretty vintage Bunting. 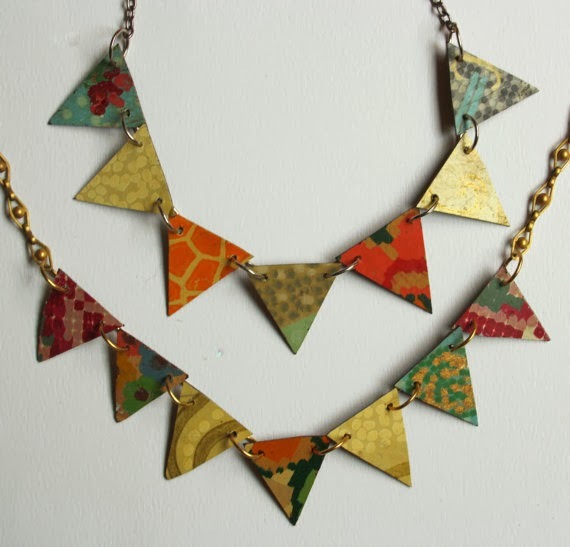 It is 160cm long with eight vintage lino flags linked together with jump rings and finished each end with an 18cm chain. It would be perfect for a kitchen, patio, verandah, or anywhere really! It even looks alright hanging out in the scout hall that is my lounge room. And it's pretty hardy so would cope with the elements outdoors as well. 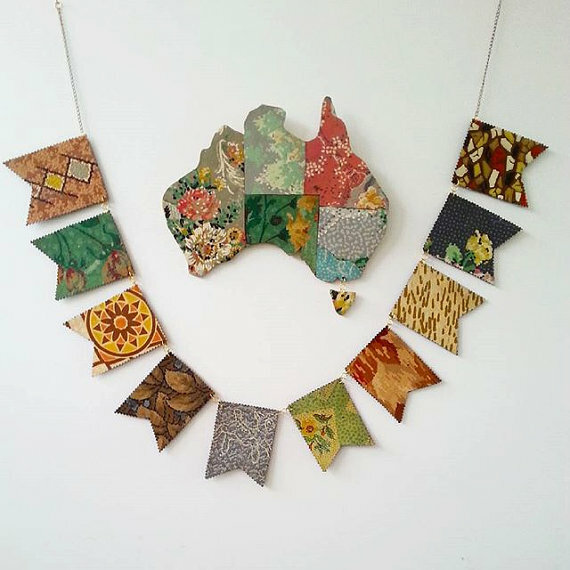 You can get your own custom made Bunting from my Etsy store or my real life shop Gleaners Inc.
After the success of my Lino Bunting necklaces, I'm hoping this bigger bunting will appeal to the same vintage loving peeps!!!! Well that's almost it for another year. A year of big highs and annoying lows, business and artful juggling, plans and ideas ( some fruitful, others not so), decisions made, minds changed. Just your normal roller- coaster ride on the Big Dipper of life. In my creative life I made a couple of good decisions. 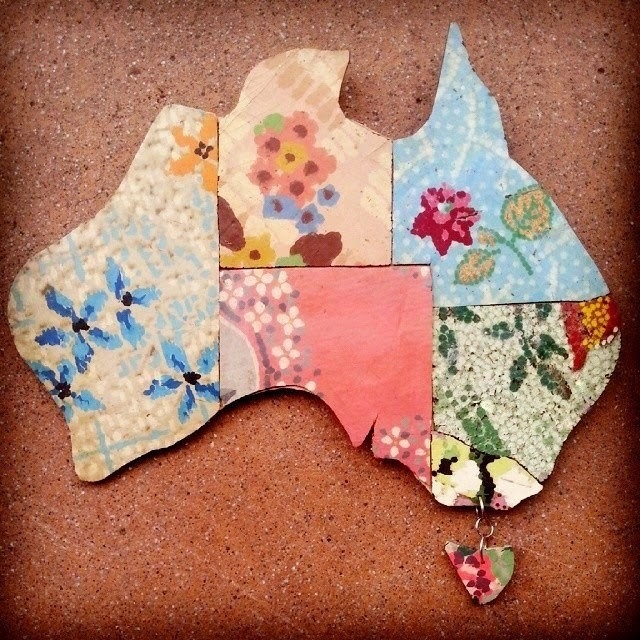 Making these Maps of Australia for the wall was one! 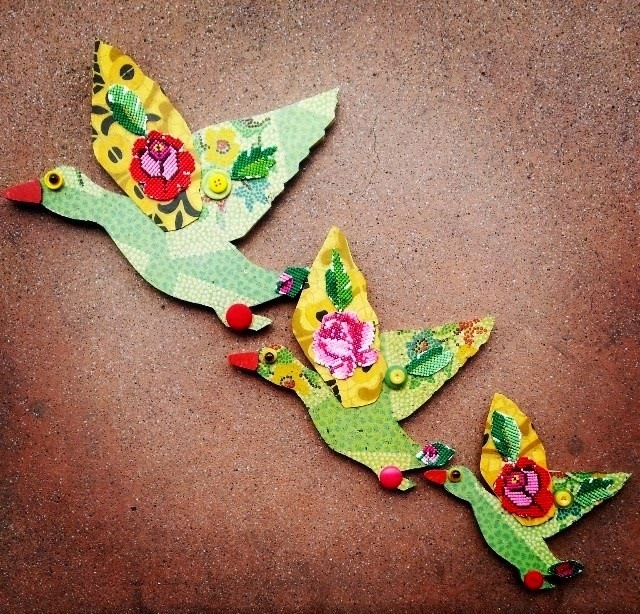 Going with my friend Lois to the salvage this amazing lino also proved to be a wise move, as I have been able to incorporate it into loads of Betty Jo goodies this year! 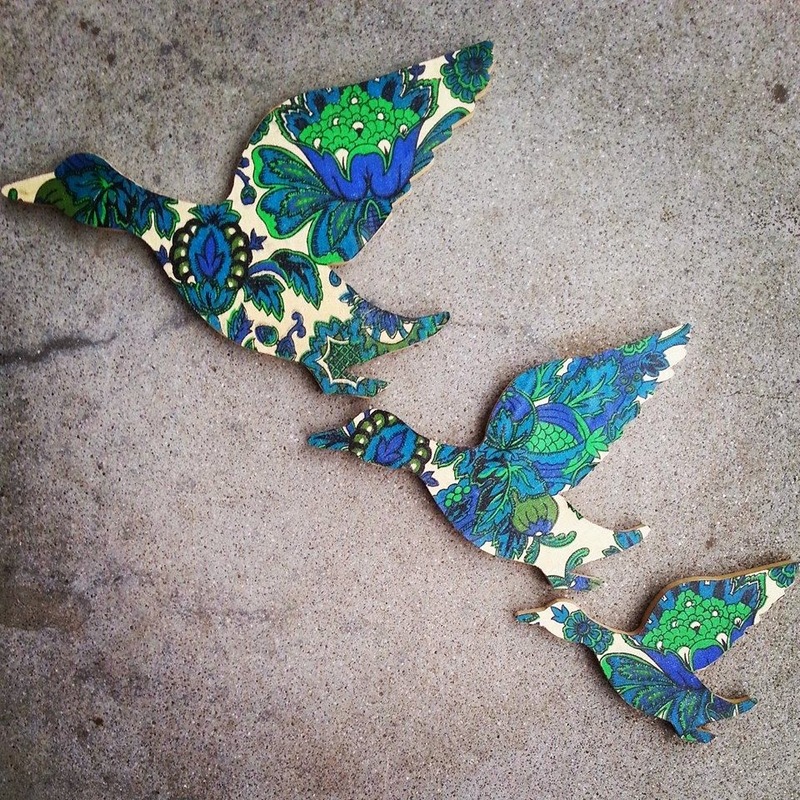 Like these Flying Ducks, ordered by a lovely man as a Chrissy gift for his vintage lino loving wife! 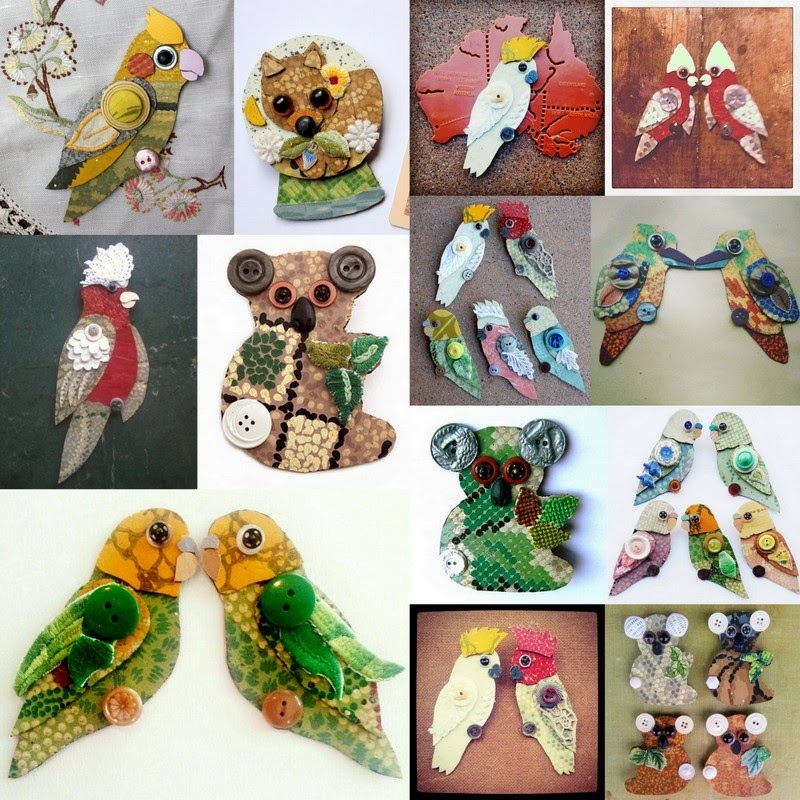 And of course brooches...oodles of brooches! 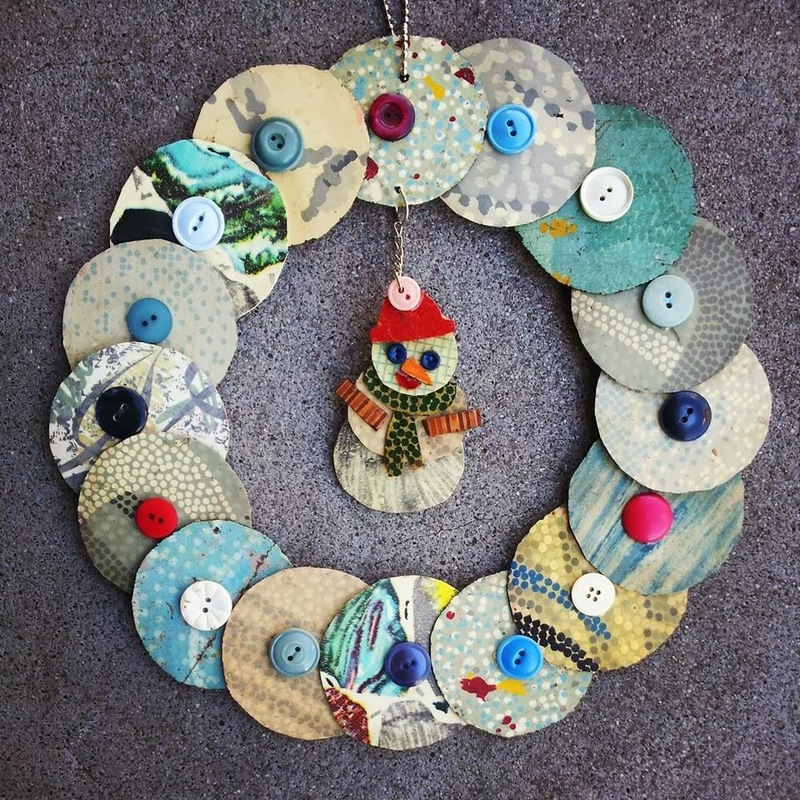 And to continue the Christmas tradition, I made a limited number of wreaths for all seasonal persuasions! Best wishes for Christmas and here's to a great 2014! Available from my online store. Click on pic for more info. New clocks appearring regularly. Click on pic. to see some! Custom Orders can be arranged. Click on the pic. to custom order your set. 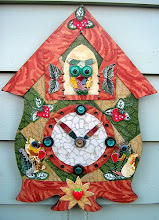 Betty Jo Designs Clock Shop! This is were you can see them all! Read about Betty Jo(aka) Liz! 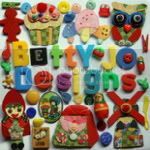 Betty Jo Designs is licensed under a Creative Commons Attribution-Noncommercial-No Derivative Works 2.5 Australia License. Keep Reading...it will be fun I promise!